After winning ten straight, the Colorado Avalanche have come back down to Earth. They’ve lost four of their last five games and Nathan MacKinnon for 2-4 weeks with a shoulder injury. In MacKinnon’s absence, the Avs returned from the All-Star break to grind out an overtime victory over the struggling Edmonton Oilers but generated no offense in a lackluster 3-0 loss to the Winnipeg Jets on Saturday. The key difference between the winning streak Avalanche and the back-to-Earth Avalanche? The loss of MacKinnon’s shot volume. Looking at the upcoming schedule, Colorado has a golden opportunity to create a gap in the Western Conference wild card race; only three of the next 12 games will be against teams in a playoff spot, including two very winnable road games against the Buffalo Sabres and Vancouver Canucks. The timing couldn’t be better. MacKinnon is set to return near the end of this run and, along with a now-healthy Semyon Varlamov, could help the Avs lock up a playoff spot. To fully capitalize, however, Colorado needs to generate more offensive pressure without their Hart Trophy candidate. 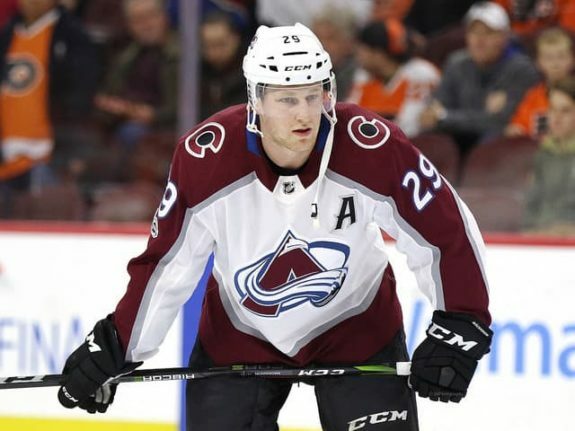 When the Avalanche lost MacKinnon they lost a lot more than just his ability to put the puck in the net; they lost his ability to put the puck on net. He leads the team in shots on goal (164), shot attempts (287) and relative Corsi for per 60 minutes (6.79). When he was on the ice, teams had to respect his shot from anywhere in the offensive zone. His high level of shot production did more than what appears on the scoresheet. Teams were forced to play deeper against the Avs’ top line and those shot attempts led to more stoppages and faceoffs in the offensive zone (which, admittedly, the Avalanche aren’t winning). This pressure was paramount to the Avs’ historic win streak, and that’s a tall order to replace. Mikko Rantanen will likely pick up some of the offensive slack while MacKinnon is out but his linemate, Alexander Kerfoot, could stand to shoot the puck more. A lot more. One of the biggest surprises this season for the Avalanche has been the play of rookie Alexander Kerfoot. He is fourth on the team in goals and points, and what stands out is his ability to always be directly involved in the attack. He has the second-highest primary points/60 minutes on the team, trailing only MacKinnon. The one criticism, however, is his hesitance to shoot the puck. Kerfoot has only 45 shots on goal this season and only 76 total attempted shots, which comes out to around 7 shot attempts per 60 minutes with an average of .93 shots per game actually going on net. By comparison, MacKinnon averages 18.21 shots per 60 and gets 3.35 shots on goal per game. When Kerfoot’s shots do end up on target, they tend to find the back of the net; only Washington’s Brett Connolly has a higher shooting percentage in the NHL (by players appearing in at least 30 games). It’s also important to note that Kerfoot’s ice time is far lower than the other primary offensive producers on the team and that his role is primarily as a play-maker. But, at least in the absence of MacKinnon, the Avalanche need him to be more selfish in his shot selection. While few would have predicted that the Avalanche would be as bad as they were last season, even fewer thought they would still have a shot at a playoff berth in February. If they are going to contend in the hyper-competitive Central Division, it’s important for a team like Colorado to get every small part of the game right. Kerfoot isn’t going to replicate MacKinnon’s ability to score goals, but he can replicate his ability to put shots on goal. 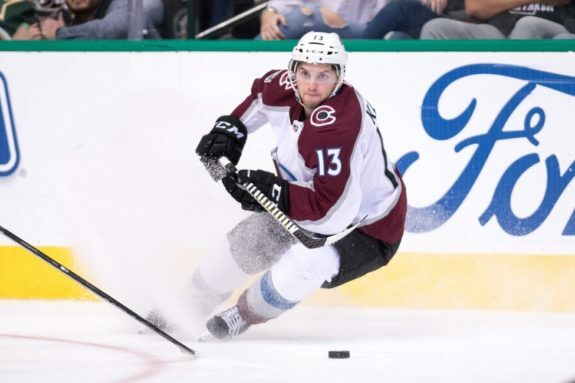 Until MacKinnon’s return, it’s time for Kerfoot to step outside of his comfort zone and start shooting the puck.